Worldwide soccer fans follow players like Lionel Messi as the Argentine is consider by fans as being one of the best if not the best individual player in the sport. He has led his club team Barcelona to European championships, Spanish La Liga championships and more during his professional career. However, Messi may be on the verge of missing out on playing in the 2018 World Cup in Russia. 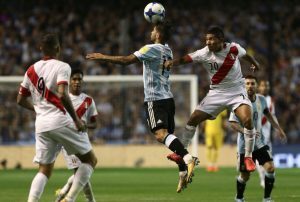 The Argentina national team played to a 0-0 draw against Peru in Buenos Aires Thursday night, which brought them closer to missing the World Cup for the first time in 48 years. Just one round of qualifying matches remains in South America. Argentina, which in the 2014 World Cup held in Brazil finished as the runner up to champions Germany, will play Tuesday versus Ecuador. The match will be played high in the Andes Mountains in Ecuador’s capital Quito. After the next to last round of qualifying, Argentina sits in sixth place, with only the top four places receiving an automatic berth in the World Cup. The team that finishes in fifth place could qualify by winning a playoff match later this year against New Zealand. Brazil has qualified already and played on Thursday to a 0-0 draw versus Bolivia. Brazil sits at the top of qualifying on 38 points, followed by Uruguay with 28 points, Chile with 26 points, Colombia with 26, Peru with 25, Argentina with 25 and Paraguay with 24. Bolivia, Venezuela and Ecuador have all been eliminated. This has become one of the tightest races for World Cup qualifying, but it is expected that Uruguay will clinch a berth Tuesday, but after that there are four teams that are chasing the final two spots that produce automatic berths. That leaves two teams attempting to reach the fifth-place playoff against New Zealand, which appears to be the only route Argentina has to reaching next year’s World Cup. The Argentine national team must win in Quito and at the same time receive help from others. On Thursday, in other South America qualifying matches, Paraguay defeated Colombia 2-1, Uruguay was held by Venezuela 0-0 and Chile defeated Ecuador 2-1. Next week, Argentina will need help from Colombia who will play Peru. Peru is tied on points with Argentina but holds the tiebreaker. If Argentina wins and Peru is beaten by Colombia, the Argentine team will play New Zealand for a berth. Chile must play Brazil and if Chile is defeated and Argentina and Colombia beats Peru, Argentina could automatically qualify.